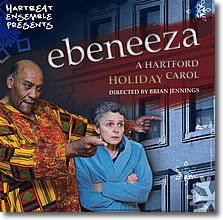 Ebeneeza is a retelling of Charles Dickens' A Christmas Carol, set in modern-day Hartford. Audiences will follow the story of the elderly woman Ebeneeza. The miser is, of course, visited by three ghosts, including Hartford's favorite "Ghost of Holidays Past," Mark Twain. In keeping with HartBeat tradition, the words and concepts of Ebeneeza come from interviews with citizens of the Greater Hartford community. Ebeneeza: A Hartford Holiday Carol explores issues of class, race, and development while simultaneously reflecting Dickens' themes of generosity and self-reflection. The production takes us from Ebeneeza's childhood home on Front Street during the Depression, through the civil upheavals of the 60's in the North End of Hartford and into the Greater Hartford suburbs of the 80's. This year, Ebeneeza will literally move throughout the city, traveling through each neighborhood in order to connect with more communities. These traveling productions of Ebeneeza: A Hartford Holiday Carol reflect the ensemble's mission to bring original, affordable theater to Hartford's neighborhoods. The play has been updated to reflect current concerns, including "Obamacare," the emersion of the "Tea Party Patriots," the effects of the bailout, and developments in the foreclosure crisis. Ebeneeza is written by the HartBeat Ensemble and directed by Brian Jennings. This production is made possible by the City of Hartford Arts & Heritage Jobs Grant Program, Eddie A. Perez, Mayor; and supported by The Greater Hartford Arts Council's United Arts Campaign, The Edward C. & Ann T. Roberts Foundation, The Connecticut Commission on Culture and Tourism and The Ensworth Memorial Trust, Bank of America, Trustee.